Winning for the third straight week with a smash-mouth running attack, the Wood River High School football team (3-1) amassed 363 rushing yards on 60 carries Friday and wrapped up a 20-6 non-conference road win over the Gooding Senators. The Wolverines dominated ball possession 29-19 in minutes with the ball and owned an 18-9 edge in first downs. The Hailey defense held Gooding to 84 rushing yards and capitalized on two lost Senator fumbles—both becoming pivotal plays. Coach Kevin Stilling's Hailey squad has now rushed for 1,407 yards in four games and has allowed only four touchdowns in three straight non-league triumphs over Buhl, Wendell and Gooding. Going back to last season, Wood River has won five times in six starts—three on the road. "Our offensive line made blocks when they had to, but there's still room for improvement," said Stilling about Hailey's first win in 12 years on the Gooding field. "Our defense executed our game plan and continues to play extremely well against the run." Senior Greg Lindbloom (32 rushes for a season-high 209 yards) scored Wood River's first two touchdowns for a 14-0 halftime lead. After Gooding cut its deficit to 14-6, Wood River iced its victory with an 80-yard TD drive covering nearly six minutes that ended with the first varsity touchdown by junior quarterback Tommy Bailey, on a QB sneak. Austin Hafer, senior back, supplemented Lindbloom's relentless assault on the Senator defense with 103 yards of his own, on just nine rushes. Leading the Hailey defense were Drew Barsch (11 tackles), Lindbloom (8) and Jake Vegwert (6). Stilling had good things to say about the effort of coach Cameron Andersen's Gooding Senators (0-3), who pushed Wood River to the very end and never gave up. He said, "Gooding will play whistle-to-whistle, for the full four quarters. They made it very hard for us to run the edges." Indeed, the game would have been much closer if not for the two costly Senator fumbles. Gooding stopped Wood River's first drive at midfield and forced a Trace Tupper punt. Junior Ben Williams made a crushing tackle on the Gooding punt returner that forced a fumble, which was recovered by Lindbloom at the Senator 22. Five plays later Lindbloom followed blocks by Barsch and Vegwert for a six-yard TD run. In the second quarter Lindbloom rushed six times for 61 yards on a 10-play, 66-yard Wolverine scoring drive that was helped by two offsides penalties whistled against Gooding on third-and-short plays designed to draw an opponent across the line. Braxton Parish's two-point conversion run made it 14-0. Yet Gooding bounced right back on the passing of junior quarterback Josh Faulkner (10-for-18 for 163 yards, 1 TD). Faulkner connected twice on third-and-long situations with 6-5 senior wide receiver Matt Hutcheson—the first for 15 yards on a down-and-in slant and the second for 32 yards on a post pattern. Faulkner then scrambled for 11 more yards down to the Wolverine six-yard-line. With 42 seconds left in the second quarter, Gooding called time out on second-and-goal from the three. Faulkner handed the ball to junior back Kyle Rison, who was gang-tackled by several Wolverines at the goal line. In the grasp and going down, Rison tried to reach over the line with the ball for a TD. But he lost control and Hafer recovered the ball in the end zone. It wasn't all bad for Gooding. Starting at their own 17-yard-line in the third period, the Senators got an excellent break when Faulkner's underthrown pass was tipped by Hailey defensive back Parish and deflected right into the hands of Hutcheson at midfield. Hutcheson completed an 83-yard TD play and suddenly the score was 14-6. That's when Wood River responded with its longest drive of the evening—80 yards in six minutes with Lindbloom rushing for 31 yards and Hafer for 35 more on end runs. In the red zone Wood River gave the ball four straight times to Lindbloom and ended up with fourth-and-goal at the one. Stilling called time and huddled with his offense. Nearly 10 minutes remained in the game. "I wanted to give Greg the ball for another yard, since our belly play has been our best play all year. But I have to give the kids credit. They said, 'Let's go with the quarterback sneak,' so that's what we did," said Stilling. Bailey took the snap and carried the ball forward. He was initially thrown backward by Gooding's line charge, but he kept his legs moving and Lindbloom gave him a helpful push from behind to get Bailey across the goal line. Gooding coach Andersen complained that Bailey got an illegal assist from Lindbloom, but the officials disregarded the protest. Led by Faulkiner's passing and running, Gooding put together one more determined drive, 11 plays for 71 yards over six minutes to the Wolverine nine. That's where the Hailey defense made another stand, with keys tackles by Barsch, Vegwert, Chris Carnes and Lindbloom ending the threat. 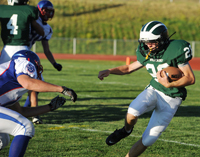 The Great Basin Conference league season begins in earnest Friday, Sept. 23 when Wood River entertains the Jerome Tigers in the 2011 Homecoming football game at Phil Homer Field. Opening kickoff is 7 p.m. preceded by a tailgate barbecue and featuring the Homecoming royalty announcement at halftime. Jerome is the opponent that Wood River players wanted for their Homecoming game this season. But "parity rules," is the one thing already established about the 2011 Great Basin. "You've got to come ready to play," said Stilling. Coach Gary Krumm's Jerome Tigers (0-3, 0-1 league) have been routed at Middleton and Bishop Kelly, then saw their 13-7 and 23-15 leads over Canyon Ridge melt away in a 31-29 home loss to the Riverhawks last Friday. Over two seasons, Jerome has now lost six of its last seven games. But Jerome is Jerome, always a thorn in Wood River's side. Jerome leads the 38-season series with Wood River 34-4 including last fall's 35-13 Tiger win at Jerome. It was Jerome's fifth straight victory over Wood River by a combined 208-83 score. The Wolverines last beat Jerome 16-0 for coach Mike Glenn at the Hailey field in 2005. Jerome was 0-9 that year. Stilling said the Tiger passing attack will cause problems for a Wolverine secondary still gaining experience in pass coverage. He said, "Jerome throws the ball so much. It's a challenge to find ways to pressure them because they see it coming and get rid of the ball. If you take a chance, they can make you pay." On offense, Stilling said, "We haven't been clicking on our passing game. We need to be more well rounded with our offense. We need to take care of the football on offense and keep things in front of us on defense, so we don't give up big plays." Besides Jerome's narrow loss to Canyon Ridge (3-1, 1-0), Friday's stunning news was the 16-6 Burley victory over host Twin Falls (1-2, 0-1). Burley (1-2, 1-1) had lost 14 straight games dating back to a 35-14 victory in Hailey in 2009. The Bobcats (4-39 since 2006) had fallen to Twin Falls 45-0 and 28-6 the last two years. The Minico Spartans (4-0, 1-0), Great Basin king five of the last six seasons, are averaging 47 points per game including a 47-8 win at Burley. Minico visits Canyon Ridge this Friday while Burley visits Kimberly and Twin Falls goes to Century. WOLVERINE NOTES—Wood River's rushing totals in four games are 170 carries for 1,407 yards (8.3 per carry, 352 yards a game). Greg Lindbloom has 73 carries for 542 rushing yards (7.4 per carry) and 9 TD. At Friday's halftime, Gooding honored its only state championship football teams, back-to-back in 1984-85 for coach Bob Milligan under the State A-3 banner. The Senators were unbeaten at 12-0 in 1984 and defeated Homedale 21-7 in the finale. In 1985, with A-3 "Player of the Year" senior quarterback Todd Simis and A-3 "Offensive Back of the Year" Danny Dally, the Senators lost 27-26 at Jerome in their second game and then won 10 straight including the 40-20 championship finale over Homedale. In those two seasons, Wood River lost 42-7 at Gooding in 1985 and 40-0 in 1984. Rushing—Greg Lindbloom 32-209 (6.5 per carry), 8 1sts, 2 TD; Austin Hafer 9-103 (11.4 per carry), 5 1sts; Ian Keys 5-13; Braxton Parish 5-17, 1 1st, 1 conv. ; Tommy Bailey 5-8, 1 TD; Gus Conrad 1-9; Trace Tupper 2-4; Chance Larkin 1-0. Fumble recoveries (2)—Greg Lindbloom 1, Austin Hafer 1. Punt returns returns—Colton Larkin 1-12. Tackles (54)—Drew Barsch 11, Greg Lindbloom 8, Jake Vegwert 6, Ben Williams 5, Chris Carnes 5, Chance Larkin 4, Austin Hafer 4, Gus Conrad 3, Colton Larkin 3, Connor Braatz 2, K.J. Savaria 1, Trace Tupper 1, Karel Kaiser 1. Passing—Josh Faulkner 10-18, 163 yards, 4 1sts, 1 TD. Receiving—Matt Hutcheson 4-135, 3 1sts, 1 TD; Kyle Rison 2-18, 1 1st. Tackles—Cole McGinnis 15, Hank Boeger 11. Touchdown passes—Austin Hafer 1. Conversion passes—0. Notes—Wood River has scored in 12 of 16 quarters....Wood River has successfully made 13 of 20 conversions (65% success rate)....Wood River has scored 20 TD—18 on runs from scrimmage, 1 on passes, 1 on kickoff or punt returns, 0 on defense.